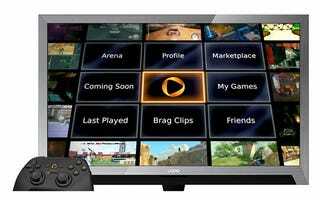 OnLive's streaming game service has been baked right into Vizio's VIA Plus TVs, plus their tablet and smartphone. It'll work through an app, with 1080p res and stereoscopic 3D gaming. PALO ALTO, CA and IRVINE, CA and LAS VEGAS, NV—(Marketwire - January 4, 2011) - At the 2011 International Consumer Electronics Show (CES) in Las Vegas, OnLive, Inc., the pioneer of on-demand, instant-play video games, and VIZIO, America's #1 LCD HDTV Company, announced a partnership to integrate the OnLive® Game Service directly into VIZIO HDTVs, the new VIA Tablet and VIA Phone and Blu-ray players in the VIA Plus ecosystem. The partnership will incorporate the OnLive cloud gaming experience across the next generation of VIZIO Internet Apps™ consumer electronics devices that share a unified, sophisticated and intuitive user interface for seamless access to high-end, interactive content. New-release premier core and casual games will be available for instant play with the flick of a remote — as fast as changing a channel — with no console, discs or downloads required. Games will be available at up to full 1080p HDTV in 3D with 5.1 surround sound, providing a rich, immersive gaming experience on the TV; OnLive game compatibility will also be extended to the VIZIO VIA Tablet and VIA Smart Phone, complementing current OnLive availability on PC, Mac® and iPad®. Since OnLive games run in constantly-upgraded data centers rather than in local devices, game performance steadily improves over time as the device ages, a key benefit for long life-cycle devices, such as TVs. "Today's OnLive/VIZIO announcement marks a major milestone: for the first time in the history of video games, consumers will be able to enjoy premium video games directly on a TV, no console or computer needed," said Steve Perlman, Founder and CEO of OnLive. "VIZIO's innovative and cutting-edge technologies are ideally aligned to complement OnLive's vision for the future of entertainment and together we look forward to providing a wealth of rich-media, interactive content to consumers this year." With the integration of OnLive across the VIA Plus ecosystem of compatible VIZIO devices, consumers can access the OnLive cloud gaming service directly through any VIA Plus HDTV, Tablet, Smart Phone or Blu-ray Player for instant gaming on any VIA Plus device — even seamlessly continuing gameplay from one device to the next — without the need for a game console. Early demonstrations of the OnLive cloud game service on VIA HDTVs are running at the VIZIO showroom and in OnLive's suite at the Wynn hotel this week. OnLive-enabled VIZIO TVs and other devices will be available to consumers later this year. "Consumer adoption and feedback on VIA has been phenomenal, and we're excited to work with OnLive to bring instant gaming direct to our products," said Matthew McRae, Chief Technology Officer at VIZIO. "Besides having on demand access to top movies, TV shows, and music, VIA Plus users will also be able to enjoy the unparalleled convenience of playing the latest hit gaming titles with the freedom to switch games much like you change the channel." OnLive launched its innovative, award-winning cloud gaming service in June 2010, enabling the instant delivery of rich gaming experiences to HDTVs via the pocket-sized OnLive Game System's MicroConsole™ TV adapter, and to PCs and Macs via a small browser plug-in. The OnLive Viewer app is available for iPad and is in Beta for Android™ tablets. OnLive's unique social features include friending, chat, massive spectating of live games in play, and Brag Clip™ videos, enabling users to record and share their greatest or funniest in-game moments. OnLive's growing game library includes over 50 instant-play premium titles priced to suit any budget, including free trials, PlayPass game purchases/rentals ranging from $2.99 to $49.99 and a recently announced $9.99/month all-you-can-play plan called a PlayPack.